An example showing how to give the PropertyGrid's Label column more width to show longer property names. By default, the PropertyGrid will use equal spacing for both sides, which may trim the end of a long property name. The RadPropertyGrid has a BestFit method that, by default, provides equal spacing to both the Label and the Value columns. The BestFit method has one overload that takes a PropertyGridBestFitMode parameter that allows you to choose a side to best fit; MaximizeLabelColumnVisibility and MaximizeValueColumnVisibility. The example below has boolean properties with long property names, these names will be trimmed if the PropertyGrid's Label & Value columns are equally spaced. 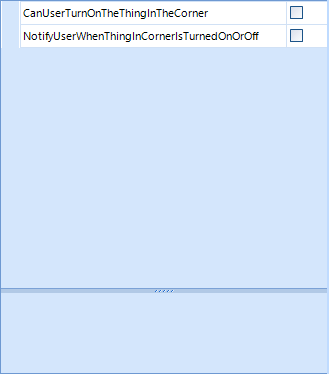 Since the editor control for a bool (CheckBox) requires very little width, you may want the Label side to be wider. In the form's Load event handler, assign the SelectedObject to an instance of UserOptions and execute BestFit with PropertyGridBestFitMode.MaximizeLabelColumnVisibility as the parameter value.